In a stock pot sauté garlic and onion, continue to cook in low heat until onions turn brown. Add cinnamon, star anise, cloves and cardamom pods stir until fragrant. Add sugar and stir until it caramelizes. Add enough water to cover chicken soup bones, bring it to a boil and simmer for 1½ to 2 hrs. or until chicken bones are soft. Using a sieve, strain the liquid and throw away the bones. Keep it cool and refrigerate overnight. Oil should have settled on top and hardened, remove this. In a separate stock pot add small amount of oil then cook minced pork until brown in colour, add the chicken meat (the ones you will flake for garnishing) and brown it as well on all sides then pour in the soup stock. Bring it to a boil then cook for 30 minutes, season with fish sauce. 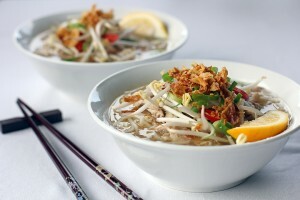 Place noodles in bowl, top it with chicken meat, spring onions, crispy fried onions, sliced chili and bean sprouts.